A local artist holds a water vigil in solidarity with West Virginia following the chemical spill. Melanie was waiting when I double-parked in the small lot next to the Milwaukee River Bridge in the Third Ward. Her breath came out like a cloud as I approached. 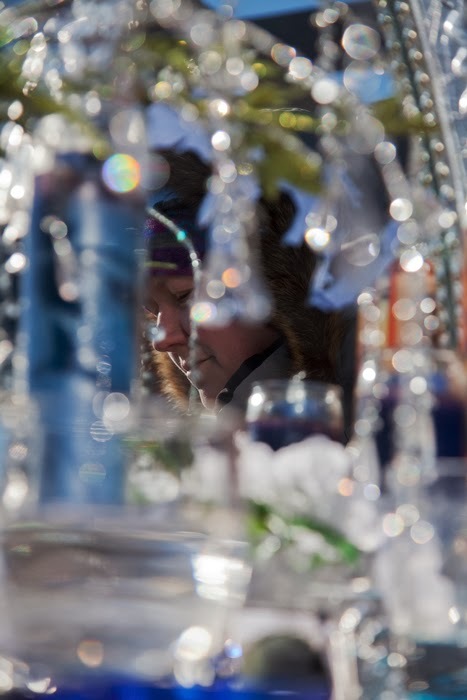 But with rosy cheeks and a buoyant spirit she greeted me cheerfully despite her wait in the –11° wind chill. 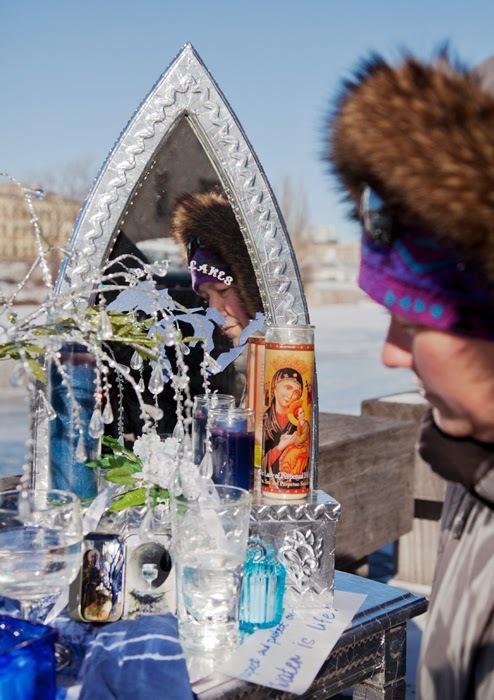 Near the end of Milwaukee’s Riverwalk she had set up a shrine on a small silvery table. 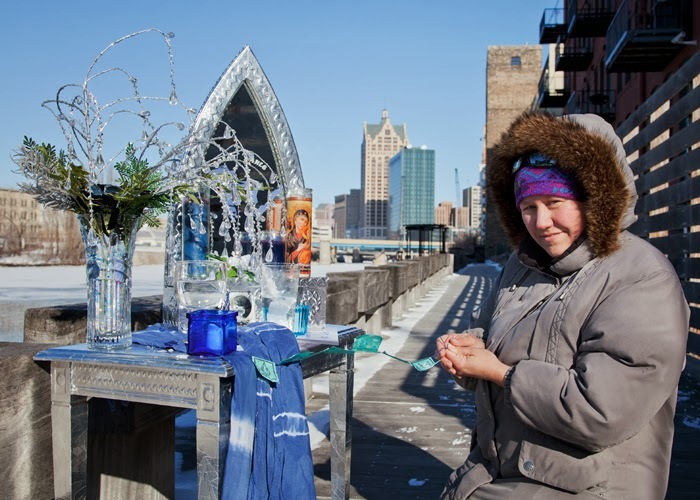 The location, where the Menomonee River meets the Milwaukee, was chosen to maximize the symbolism of the vigil for which the shrine was intended. Because of the frigid conditions, the ceremony was brief and simple. Melanie knelt beside the shrine and stretched out a string of hand-printed prayer flags she had made for the occasion while I composed a few shots to document the vigil. 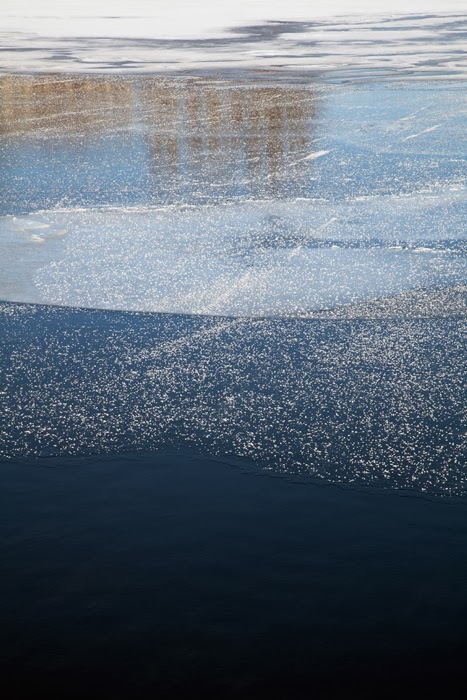 Although no one else joined in, we were not alone on the river. We noted with curiosity the presence of ducks in a patch of open water. 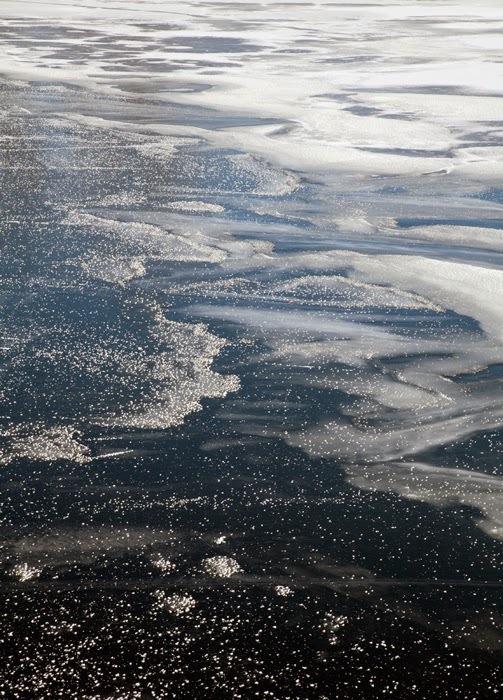 A pair of mallards and another of mergansers floated amid the steam rising off the river. 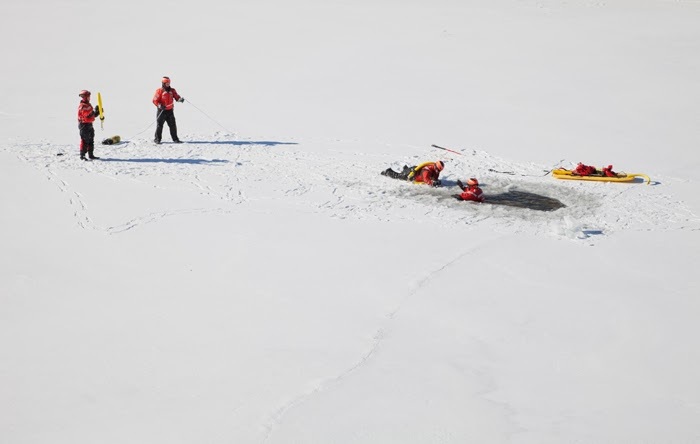 Farther upstream a team of four coast guards were practicing winter water rescue from a hole they had cut in the solid ice. Before I arrived Melanie had witnessed the passing of the barge that delivers coal to the We Energies Menomonee Valley Power Plant, taking note of the irony. West Virginia, of course, is where a recent chemical spill polluted the Elk River so badly that tap water was shut down for thousands of residents in the capitol city of Charleston. A coal company was responsible for the spill. Melanie Ariens is not new to this combination of art and activism. A self-proclaimed “multi media artist, environmental advocate and volunteer community coordinator,” Ariens bills herself as an environmental artist. 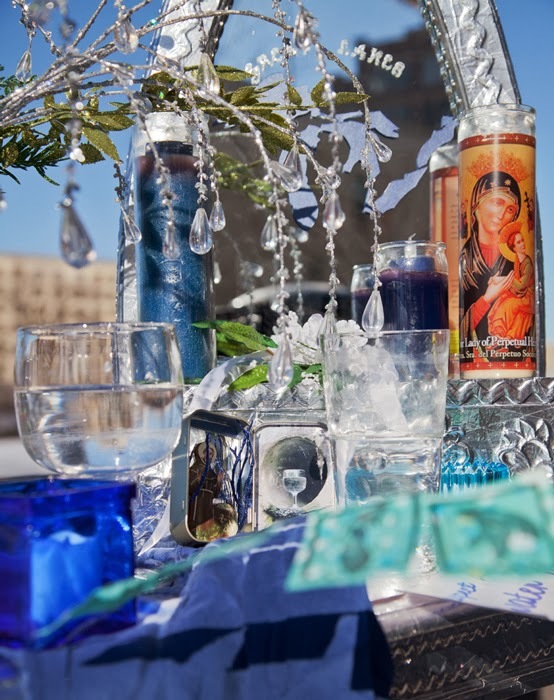 She has used the water shrine previously as an installation in other local waterways. She has a portfolio of digital images depicting a glass half full (or…?) 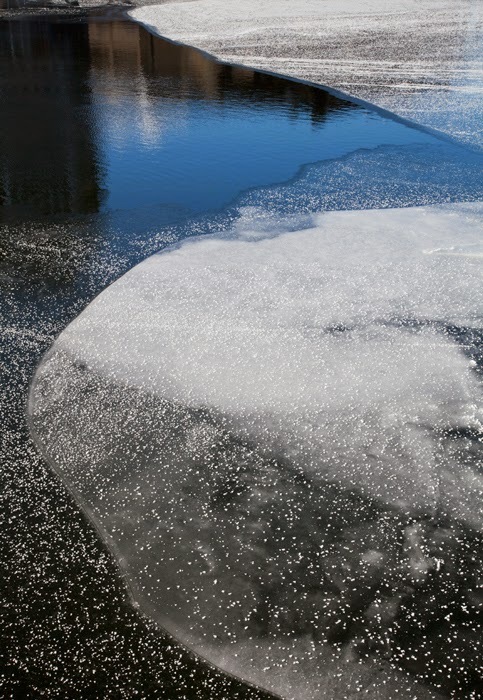 on the Lake Michigan shoreline and in a variety of streams and other bodies of water. One of her best-known works is a wall-sized rendering of the Great Lakes in denim. After about ten minutes at the shrine my gloved fingers were stingingly numb; my face and feet not far behind. 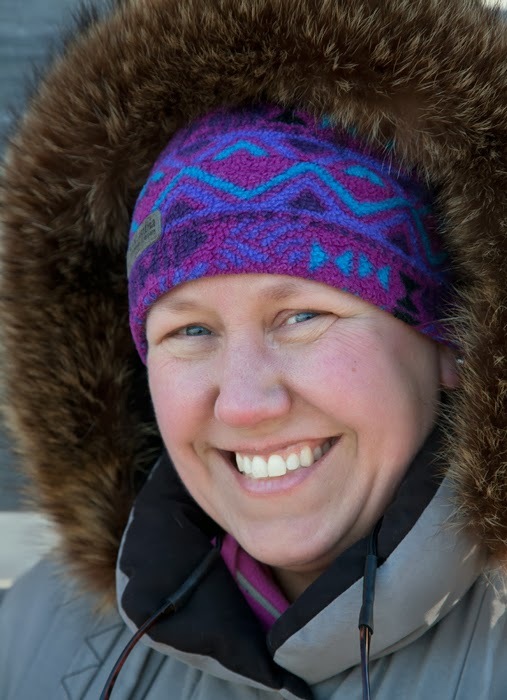 Melanie, who had been there a half-hour longer, was holding her prayer flags without gloves. Her enthusiasm never flagged however and her smile was radiant. 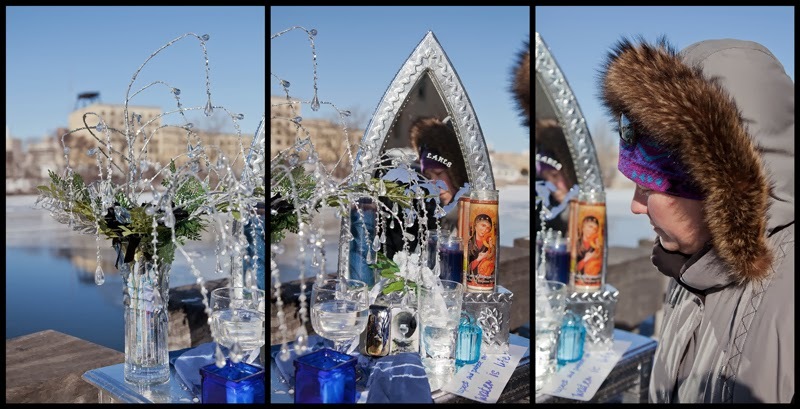 When we finished and started to disassemble the shrine we discovered that the half-full glasses of water had frozen to the surface. We pried them loose and tossed the remaining water into the river below. In addition to posting them here and on Facebook, two of our images have been uploaded to a flickr page set up by 350.org to demonstrate solidarity and share the spirit of the event. When I checked just before posting this there were 182 images on the site. To see them click here. For more on Melanie Ariens go to her website.